We have done many feeding programs in the past on behalf of marketmanila.com, its readers, and for Zubuchon. But oddly, we had never done them right in our own backyard… the barangay in which we have our offices and commissary. 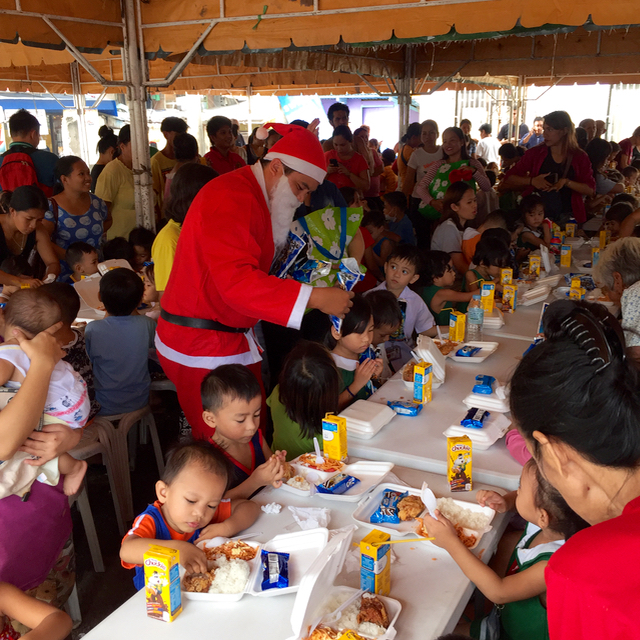 So this year, we decided to focus on providing meals to the three day care centers in Barangay Capitol Site, Cebu. 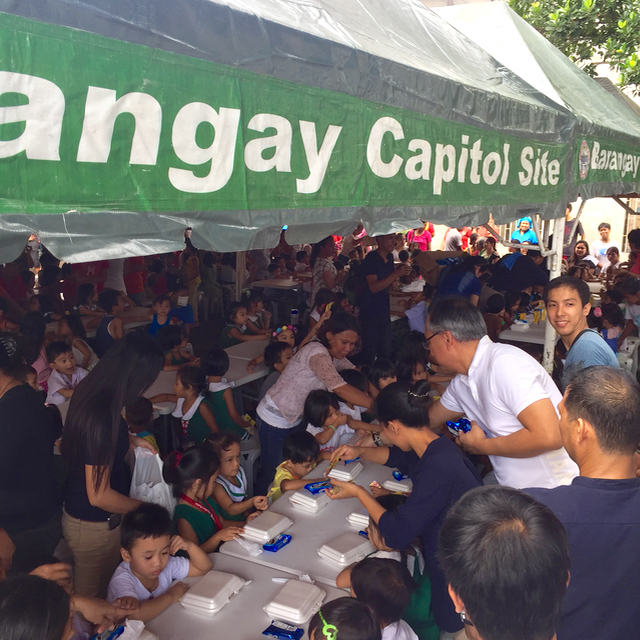 A total of 300 kids are enrolled in these day care centers, out of a Barangay population of roughly 15,000+ residents. 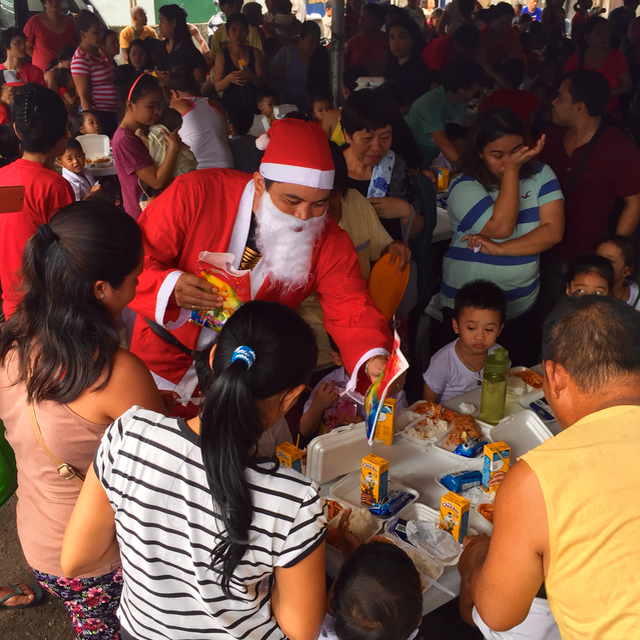 We normally do feeding programs that run for months, if not the entire school year, but this particular event was an assembled Christmas treat for 300 kids all at once outside the local barangay hall. The trick was how to feed 300 quickly and in an orderly fashion in less than 30 minutes. The answer is to pre-pack the lunches (their request), have packaged juices and desserts and mobilize 30 volunteer Zubuchon employees to do the logistics and distribution. Honestly, everyone was so ON IT that we were done in 20 minutes or so. I regret that we used styrofoam containers at this event. I know it was cheaper and convenient, but usually we use paper plates or re-usable melamine for programs with repeated feedings at one location. And you will cringe when you hear what the food was — home-cooked fried chicken, spaghetti and rice. We asked the kids in advance what they wanted and that’s what they got. No nutritionally balanced food this time around. But then again, it’s the holidays, and it was supposed to be a treat! 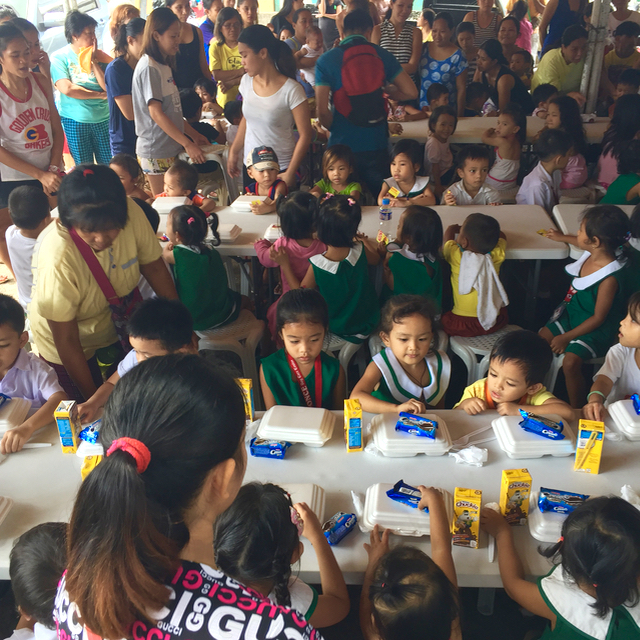 In addition to the feeding program, we will be donating children’s books to the local day care centers and reading center in 2017, and perhaps participate in reading programs for the kids. Heart warming post, thank you for doing this. Happy Christmas to your family and staff. Goodness still prevails. Cheers! ….and a blessed time was had by all. merry Christmas, everyone! oooh, so nice when these little guys give their thanks because you know they are genuine. It’s blog post like this that makes me come back for more. :) You’re also so genuine in always making a conscientious effort in trying to give back to the community. Such a great gesture for such a busy man. I wish more affluent businessmen were more like you. Have a Blessed Christmas and a joyful New Year to you and your family ! God Bless. …that is why you are so blessed, Sir! Keep it up MM, family and staff! Such a great example of service and giving. 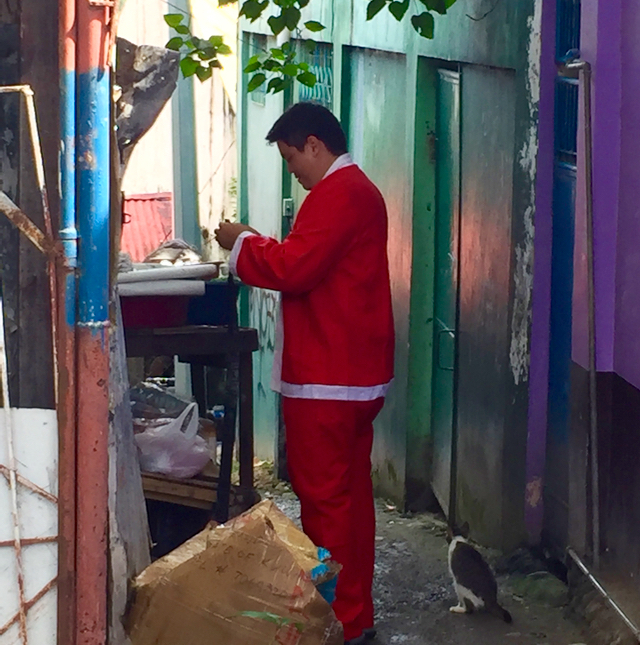 Marketman, merry Christmas to you and your family including your Zubuchon family! MM, I re-read your blog post on “Happy” a few days ago. Have you followed up on that little girl? I still tear up every time I think about her. Ohhhhh, what a wonderful post!! 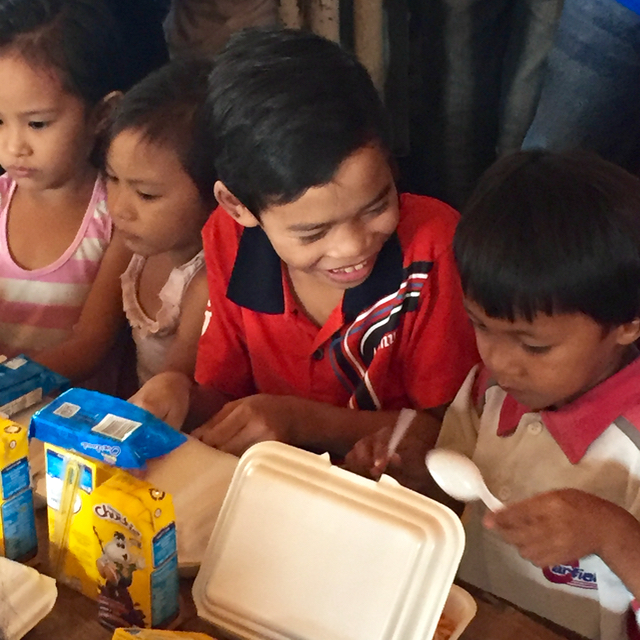 That little boy tucking in food from a container bigger than his face is PRECIOUS! At my children’s ministry Christmas party, we serve spaghetti also, and pineapple juice. They loved it. MM, you’re such a good-hearted person! More blessings to you & family and to your company! Bless you MM, may you have more blessings coming ….Merry Christmas to you and to the Mrs and the Teen. Thumbs up MM! More blessings will come your way! Merry Christmas!